As an appetizer before dinner last night Meredith served our friends Hilton and Lindsay pinzimonio–without quite knowing…! Pinzimonio, I discover (by a chance re-reading of Lesley Forbes’ lovely book, A Table in Tuscany) is a Tuscan olive oil dip, best made with the oil from newly-harvested olives. It’s usually served with raw or lightly-cooked vegetables such as fennel, red and yellow peppers, celery, radishes and artichokes. Simply pour some beautiful green olive oil on the plate, add a little sea salt and black pepper and dip a slice of vegetable in it. 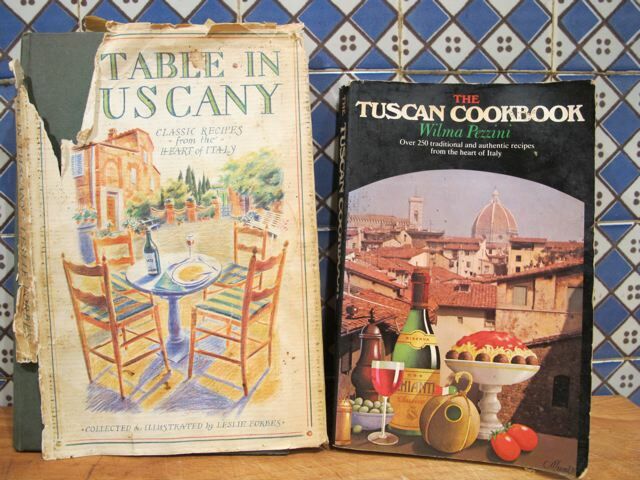 Sometimes a little lemon juice is added–but this is frowned upon by Tuscans, according to Wilma Pezzini in her Tuscan Cookbook! Meredith substituted rough country bread for the vegetables and left out the salt and pepper–‘It didn’t need salt and pepper!,’ she just said disdainfully. I watched in dismay from the stove area as the three of them dipped and dipped–putting away helping after helping of this simple but morish dish. ‘You won’t have any appetite left!‘ I cried in vain! But pinzimonio proved a true appetizer–they all managed some butternut squash soup and a healthy plate of spatchcocked chicken, romanesco broccoli (aka Roman cauliflower), green salad, Italian peccorino cheeses and baked apples! 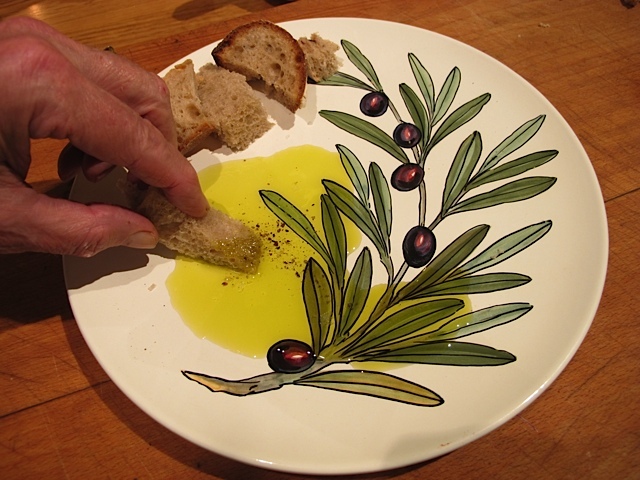 Your dinner sounds absolutely delicious…but I must say that there’s not a lot nicer than country bread dipped in good olive oil! Love pinzimonio Robin! We use as aperitiv in little quantity or like as main course with a lots and various type of vegetables… Fettunta is goodies too. A slice of Tuscany bread roasted with garlic, oil, and few salt, pepe and rosmary…enjoy!!! Yeah, I know what it is like to be at the stove cooking my best when the guests are filling up on other things!!! This sounds lovely I must try some over the week-end. You two certainly do get the taste buds going. Thank you. I love to see a well-used cookbook! I have some dating from the 70s and, while sundried tomatoes were only a gleam in someone’s eye at that point, I stll refer to the books regularly. What could be better than the best olive oil served with vegetables? The Italians have really got it right. “The Italians have really got it right.”–il faut qu’en parle doucement en France!